ST. GEORGE — A solo exhibit by nationally renowned artist Ron Larson will be on display at the St. George Art Museum beginning Saturday and continuing through Dec. 18. Patrons visiting the exhibit Saturday can take advantage of free admittance to the museum. Years in the making, the exhibit, titled “Vistas and Visions of the Colorado Plateau,” contains paintings of iconic scenes from Lake Powell, Monument Valley, the Grand Canyon, Canyonlands, Capitol Reef, Arches and Rainbow Bridge, but it also has paintings from the lesser known but equally stunning parts of the Colorado Plateau. Only the most amazing place on earth. I have always been fascinated by its landscapes. It is an ancient upthrust of land, 130,000 square miles in size, that somehow stayed together through all the earthquakes, volcanoes, and the sliding of the tectonic plates between the continents. People come from literally all over the world to see what it offers. It is scenery that can be found nowhere else, and this is what I paint. The collection has been a huge undertaking for Larson and has already spent upwards of two years on display in Page, Arizona, and Salt Lake City. Originally from the Salt Lake City area, Larson has made Southern Utah his home. Larson, along with organizers at the museum, are excited to have the exhibit on display in St. George. Larson does a lot of work with kids and young artists and says he is especially excited about the fact that fourth and fifth graders will be touring his exhibit. “I will be there with the kids as often as I can. Encouraging young people in their appreciation of art is one of my favorite things,” Larson said. Inducted into the National Watercolor Society as a Signature Member, Larson is also a member of the Oil Painters of America, the Outdoor Painter’s Society, the National Oil and Acrylic Painters Society and the National Impressionistic Society. His paintings grace the walls of private, corporate and museum collections worldwide, and three of his paintings that have been in the “Vistas and Visions” exhibit while it was at the Powell Museum were winners in art shows in the last year. Larson’s paintings get drafted into exhibits all over the country, he gives lectures on art and he regularly participates in artist in residence programs and national-level plein air art invitationals. In addition, two Utah universities have recently purchased six of Larson’s paintings as part of their public art calls. The St. George Art Museum is located at 47 E. 200 North. Operating hours are Monday-Saturday from 10 a.m. to 5 p.m. with extended hours on the third Thursday of each month from 10 a.m. to 9 p.m. Admission to the museum is $3 for adults and $1 for children 3-11 years of age. Children under 3 are free. 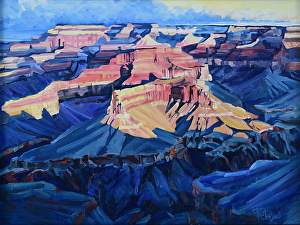 What: Ron Larson “Vistas and Visions of the Colorado Plateau” exhibit. When: Beginning Saturday and continuing through Dec. 18. | Museum operating hours are Monday-Saturday, 10 a.m. to 5 p.m.
Where: St. George Art Museum, 47 N. 200 East, St. George. Cost: Adults, $3; children (3-11), $1; children (under 3), free. Additional exhibit information: Deborah Reeder, St. George Art Museum, 435-627-4535 or Miken Bayles Larson, Ron Larson Fine Art, 435-215-8513. Resources: Ron Larson Fine Art | 11th Street Gallery.